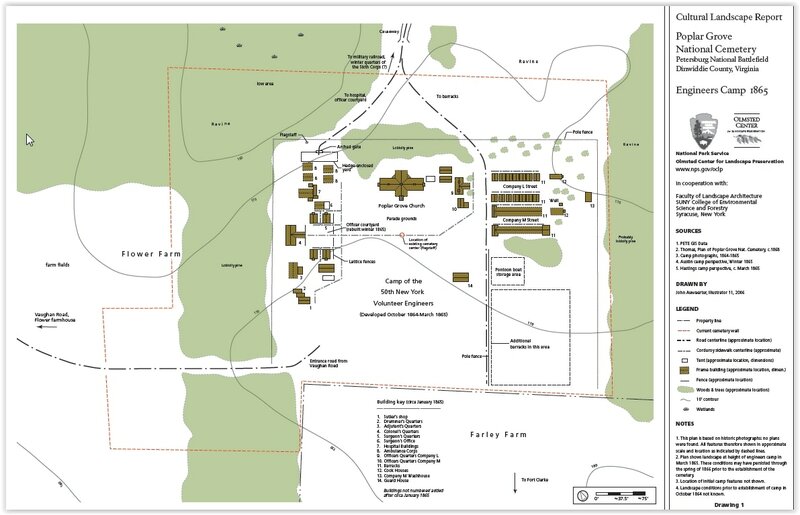 In late October, 1864, following the fighting at Peebles and Pegrams Farms, two companies of the 50th New York Engineers (L & M) made a semi-permanent camp in a 5-acre field on the Flowers Farm near the site of Poplar Springs Church. The camp site was level and dry with nearby water, two-thirds mile west of the Weldon railroad and convenient to the Vaughan Road. 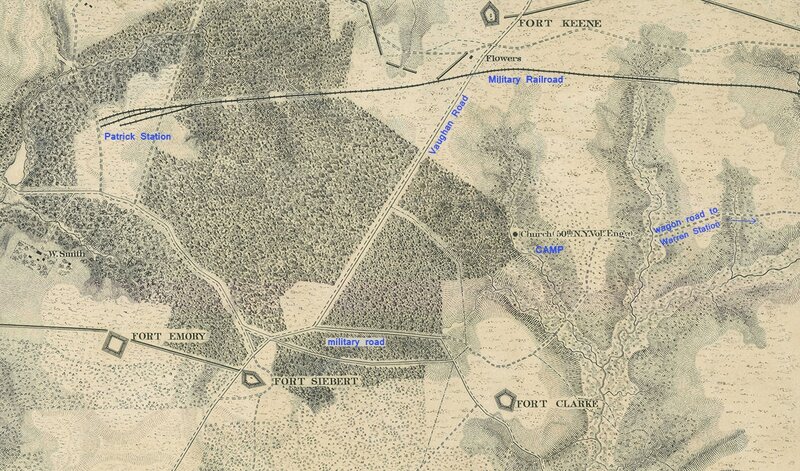 The 50th New York Engineers were responsible for constructing and maintaining the field fortifications and roads on the left flank of the Army of the Potomac. Three other companies joined the encampment in early November. 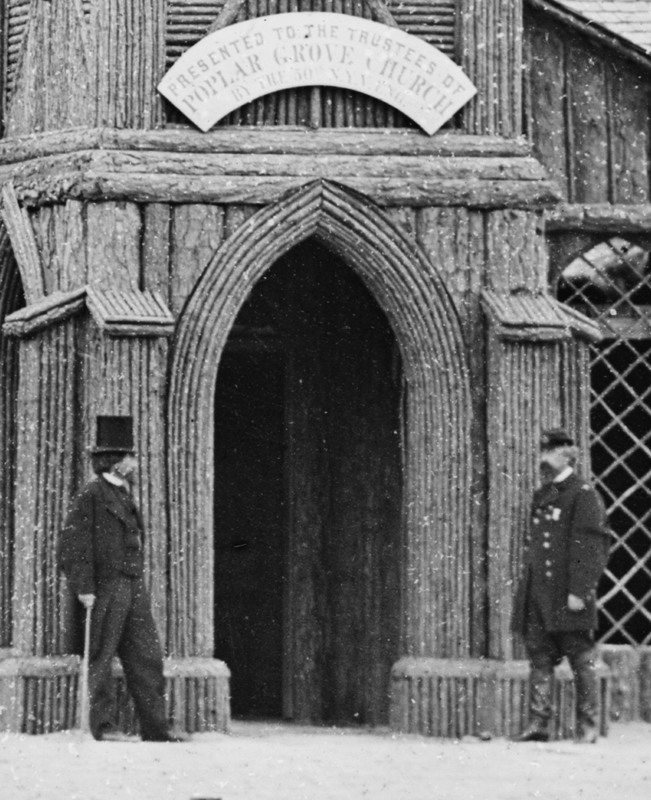 Captain William Folwell wrote in his diary that "some of the officers are putting up quite elaborate houses, more so than is worth while, I think. 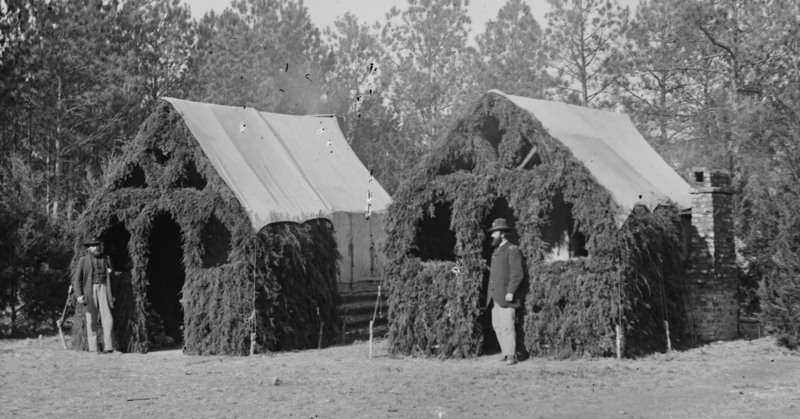 I shall be content with my tent until it is certain that the Army goes into winter quarters." Construction continued apace, however. A week later, Folwell reported "Capt. McGrath has built him a very snug house. I shall wait awhile before I begin mine.” In early December, he stated "this week we are to build quarters." On December 19th, Folwell reported "We have had a snug house built for the ‘darks’ and shall soon have our household in order. Our own house shall not build until after the men have finished their quarters upon which they are now at work. We shall have a very neat camp. I mean to have as good a house as can be built of the material accessible, viz., green pine timber and canvas. Here I stopped to go down in the street and see how the house building was getting on. The men are working very rapidly and skillfully. The cook-house is nearly complete, and is a fine one, 10 x 20 ft., with a fire-place clear across one end. As soon as the houses are done, I mean to have an oven made, and a well dug, and then we shall be ready for winter." At last, on January 19, he wrote: "​The new house is nearly done. Our front room will be a beauty, 10 x 12 ft., with a fire-place and black walnut mantel piece. A pair of shelter tents stretched over the ridge pole and forming part of the roof make a capital skylight. Tomorrow will complete the main job." 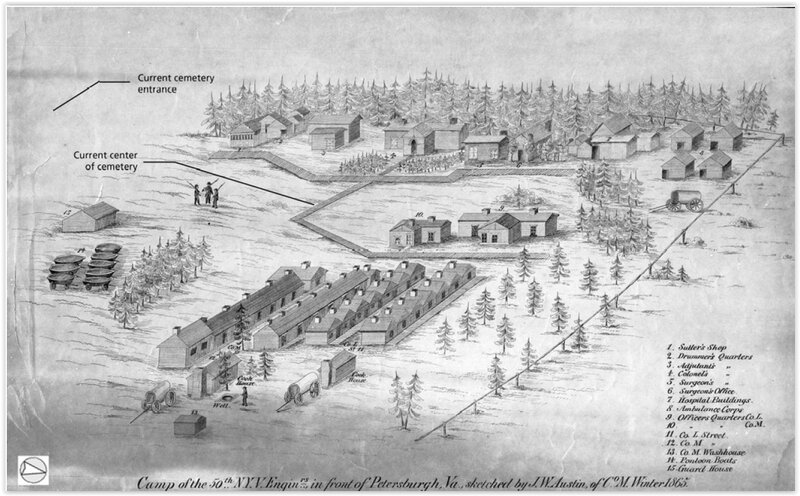 Perspective drawing of the engineers’ camp looking southwest toward Vaughan Road, probably showing conditions in January 1865. 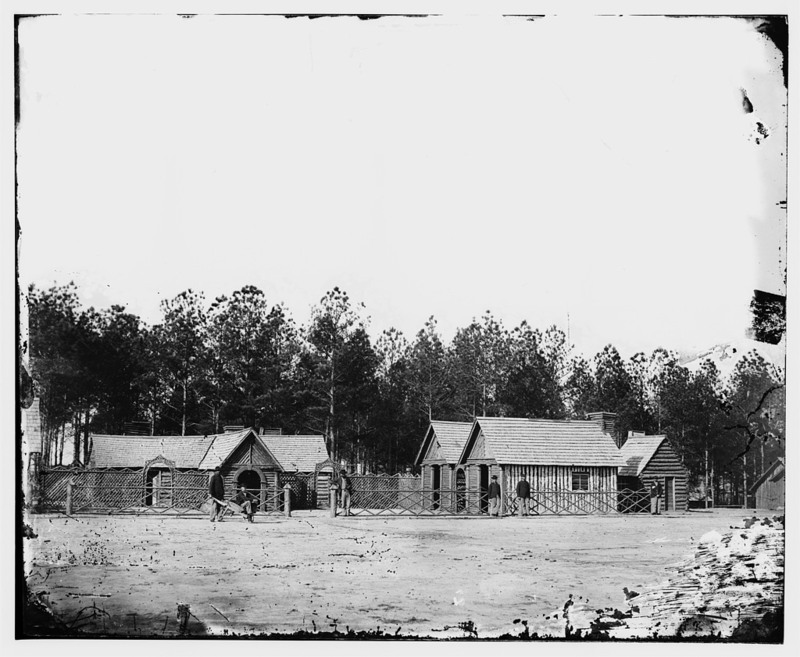 The camp at the time was under improvement and additional buildings would be added through the next few months. Virginia Historical Society, Richmond, Virginia, image 1999.161.535 (From Cultural Landscape Report For Poplar Grove National Cemetery, National Park Service 2009). Colonel Ira Spaulding commanded the Regiment, Captain McGrath, the architect and builder of the Church. In front is a group of several of the officers of the Regiment. On the foreground stands the architect himself. One view of the Church also shows, on the left, the quarters, neatly and tastefully arranged, of the Regimental officers. -- Alexander Gardner, Sketchbook of the War, volume 2, plate 74. LC 00056. 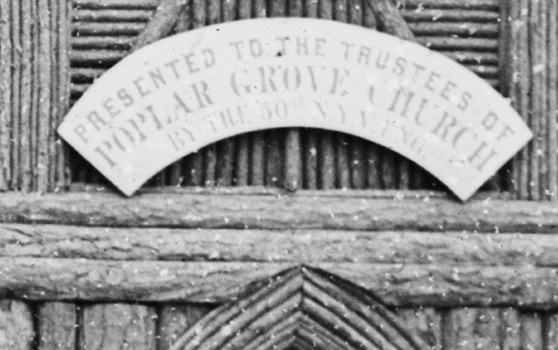 "Poplar Grove Church." Negative by T. H. O'Sullivan, positive by A. Gardner. Gardner's Photographic Sketchbook of the War, volume 2, plate 74. LC 00056 detail. Officers of the 50th New York Engineers posed in front of the church. LC 00513. "Camp of 50th N.Y. Engineers in front of Petersburg, VA Field and Staff Officers' Quarters." Stereoscopic view likely by Timothy O'Sullivan (unattributed), winter 1864-1865. 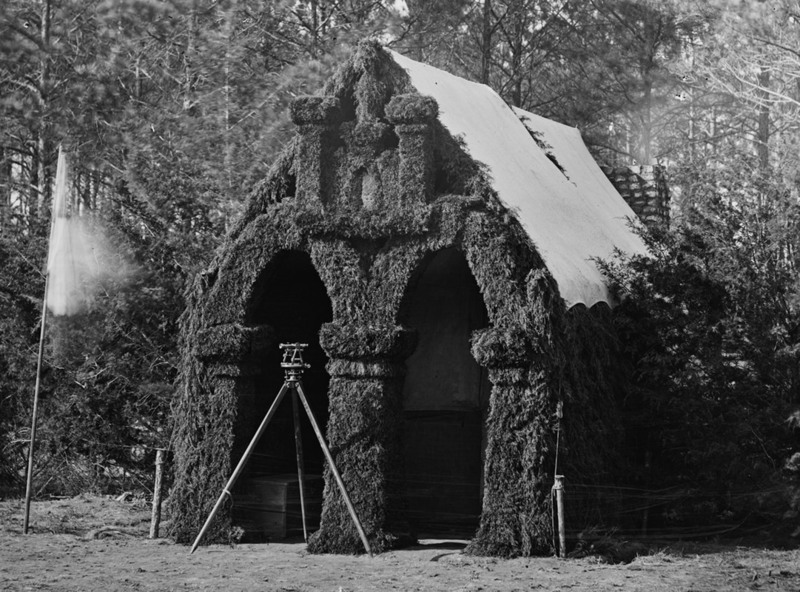 The hut on the left is fronted with the engineers' castle insignia; a theodolite on tripod stands before it. Cook fire smoke diffuses in the background. LC 00513 detail. 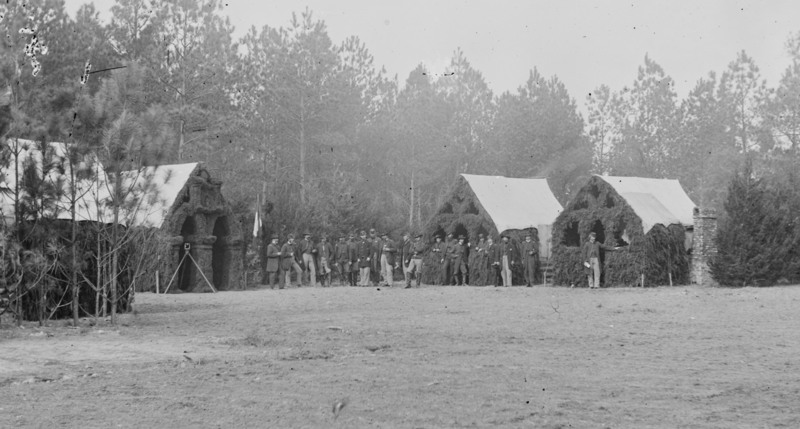 A closer view of the officers of the 50th NY Engineers in their camp at Poplar Grove. Lt. Col. Ira Spaulding is on the far left; officer next to him may be Capt. Wesley Brainerd --or not--he looks a whole lot like him. LC 00512 detail. "Col. Ira Spaulding's quarters. Camp of the 50th New York Engineers." Stereograph likely by Timothy O'Sullivan (unattributed). Lt. Col. Ira Spaulding poses in the doorway of his headquarters with a theodolite. Emblem of the engineers is woven in evergreens above the doors. This is the leftmost hut in the above image (LC 00513) with its engineers' insignia. LC 00501 detail. "Officer's quarters, 50th New York Engineers." These are to the two huts on the right of photo LC 00513 as shown above. 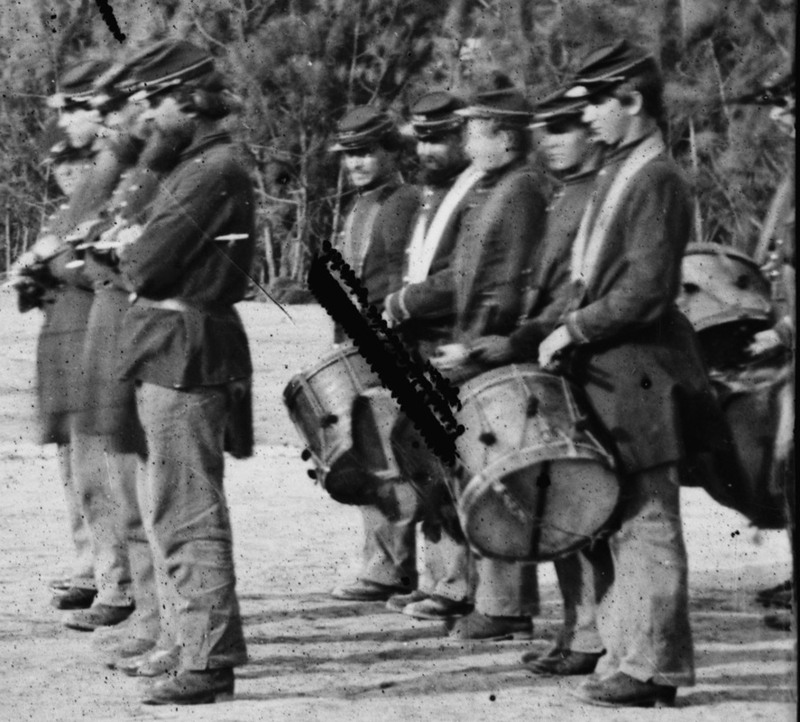 Likely Spaulding's adjutant and AAG? Cooking smoke is wafting up from behind the huts. LC 03675 detail. "[Petersburg, Va. Headquarters, 50th New York Engineers]." 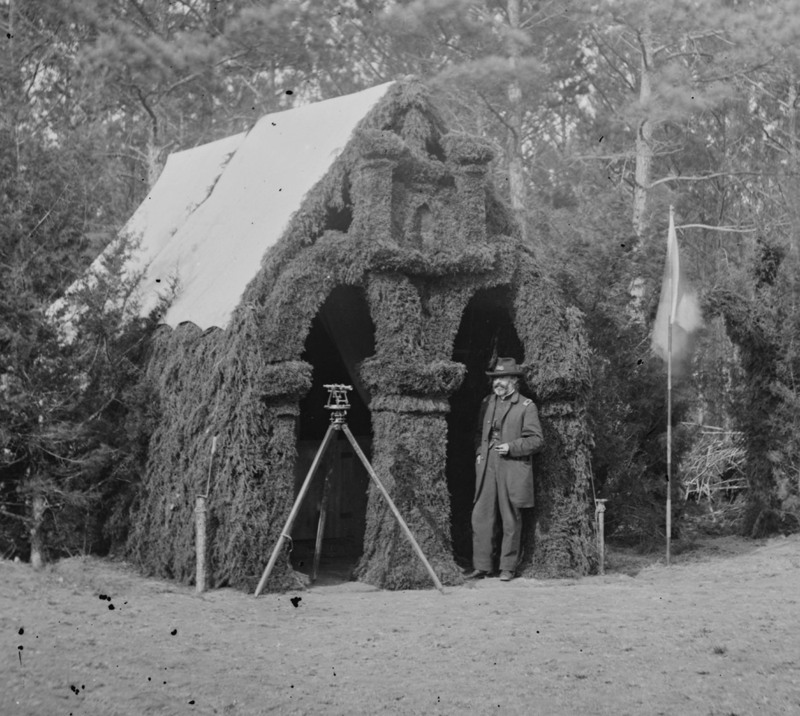 Image of Col. Ira Spaulding's office with theodolite and flag by Timothy O'Sullivan (attributed). Does it make sense that this photo is attributed to O'Sullivan and not the others in this group? "The Gothic, rustic-style church was designed by Brevet Major Michael H. McGrath, an architect-builder from Painted Post, New York, who commanded the engineer's Company F. McGrath designed the building in the plan of a modified cross, with a seating capacity for approximately 225 people. The entire structure was built of timber and featured a central tower with a spire that reached nearly sixty feet in height, shingled gable roofs with ridge ventilators, timber end chimneys, and vertical half-log walls. The main entrance, a Gothic-arched opening with recessed plank doors, was in the base of the tower, and four floor-length windows lined the facade, each with twig-lattice for muntins and cloth for glass.... At the front of the tower was the Corps of Engineers insignia executed in twigs." --Auwaerter, Cultural Landscape Report for Poplar Grove National Cemetery (2009), 25. LC 03720. 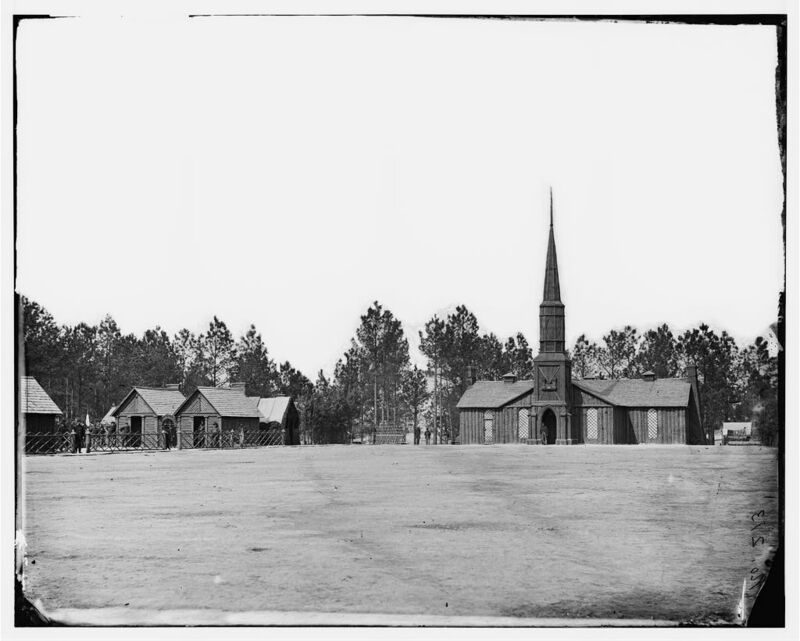 "Officers' quarters and church. Camp of 50th N.Y. 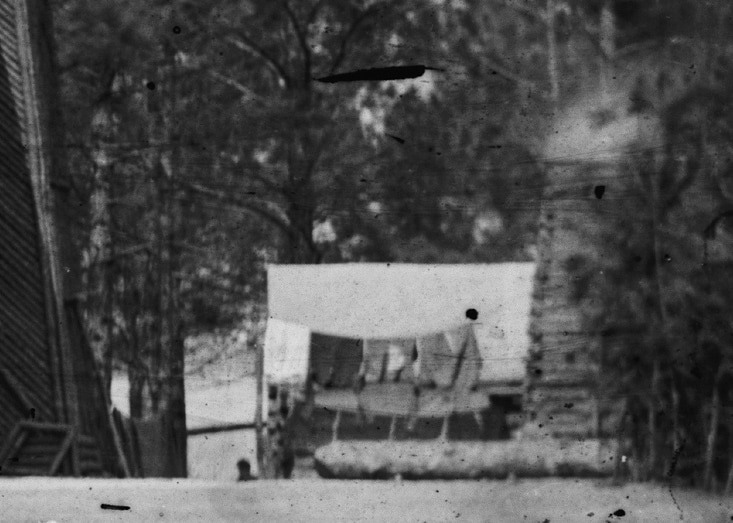 Engineers in front of Petersburg, Va, March 1865." The CHURCH. This photograph is attributed to Timothy O'Sullivan. There are many interesting details in this image, beginning with the immaculately groomed parade ground. This large format photo was taken roughly at the same time as LC 00108 above. LC 03720 detail. 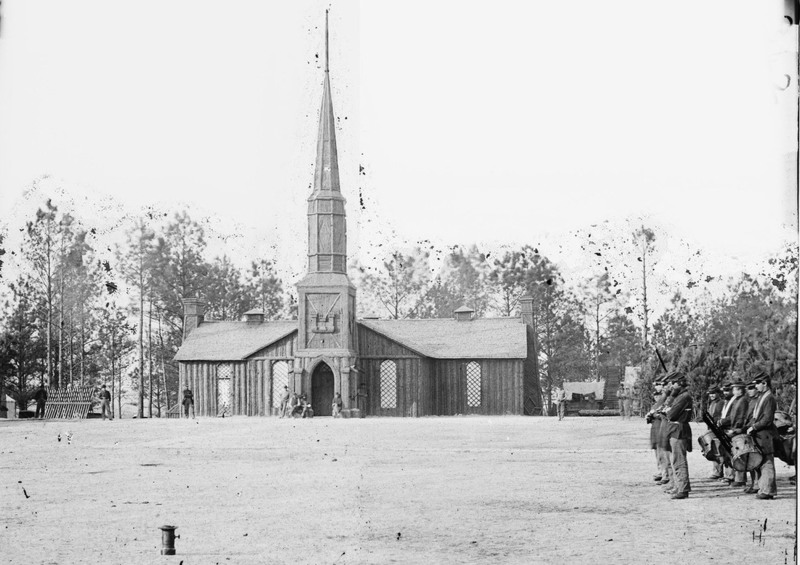 Cluster of huts to the left of the church with posed officers. LC 00108 detail. 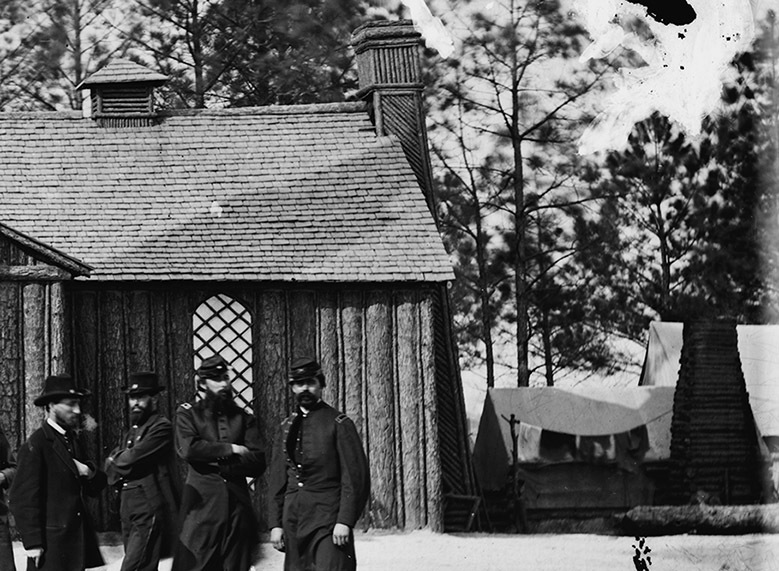 Some of the same officers as above are posed before the cluster of huts left of the church. We shall have a very neat camp. I mean to have as good a house as can be built of the material accessible, viz., green pine timber and canvas. ​-- Capt. Wm. Folwell. LC 03720 detail. Chimney smoke and hanging laundry to the right of the church. Hut roof is in full sunlight. LC 00108 detail. Laundry on the line, shadow of the church chimney cast on the hut roof. LC 04329 detail. Hut roof is nearly in full shade. LC 03342. 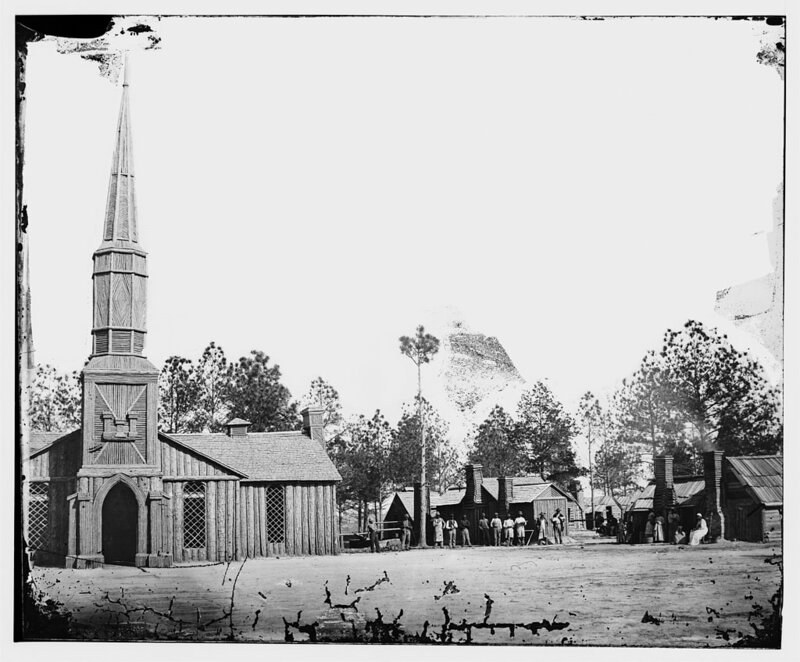 "Church of Petersburg, Va, built by 50th N.Y. engineers," unattributed view. Contraband laborers pose to the right of the church, some with their tools. LC 03342 detail. Black workers posed, some with their tools, evidence of a great deal of pride in their labor. LC 03342 detail. And the women and children. LC 00890 "Petersburg, Virginia. 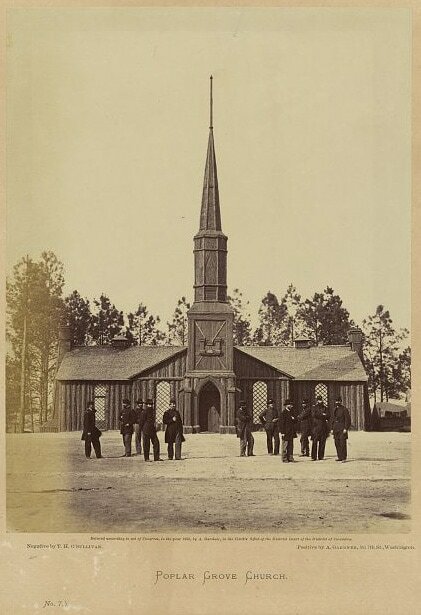 Church built by 50th New York Engineers," photograph by Timothy O'Sullivan (attributed). LC 03720 detail. Posed soldiers and model chevaux-de-frise left of the church. LC 00890 detail. Posed soldiers and model chevaux-de-frise left of the church. LC 00990 detail. Fifers and drummers. LC 03906. "Petersburg, Virginia vicinity. Headquarters, 50th New York Engineers." Major George W. Ford is posed with the Engineers' flag in the doorway of the central building. LC 03906 detail. Maj. Ford posed with the Engineers' flag. LC 03095. "Major George W. Ford 50th New York Engineers." 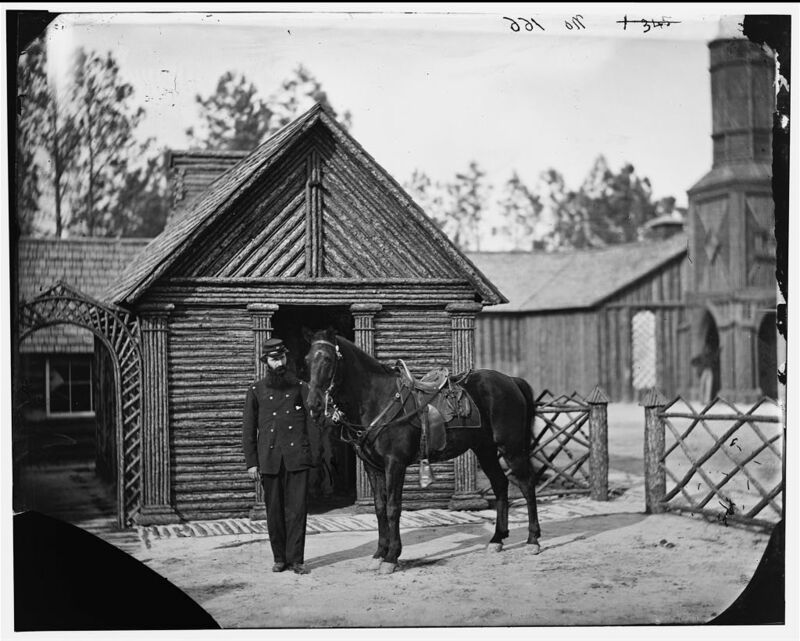 Posed with his horse in front of engineers hut, church in rear. LC 02846-02847 composite. 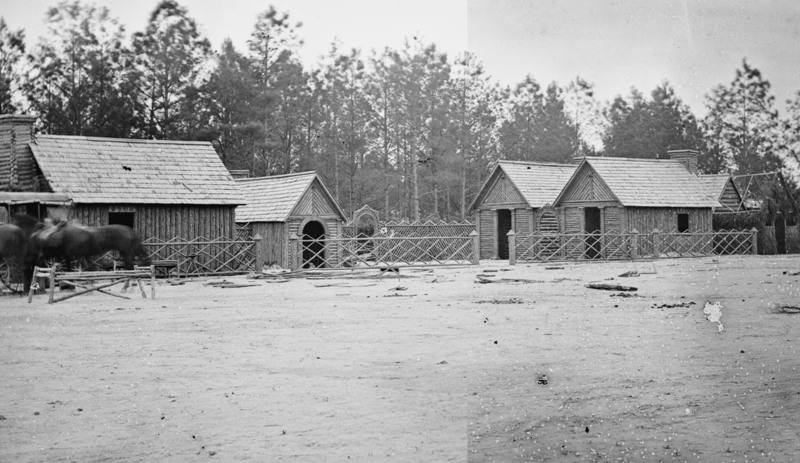 "Engineer's Quarters at Poplar Grove, near Petersburg, Va.," stereograph by Timothy O'Sullivan (attributed). After the camp was abandoned: debris litters the parade ground; canvas removed from hut on far right; windows removed from two huts. LC 02850. "Petersburg, Virginia. 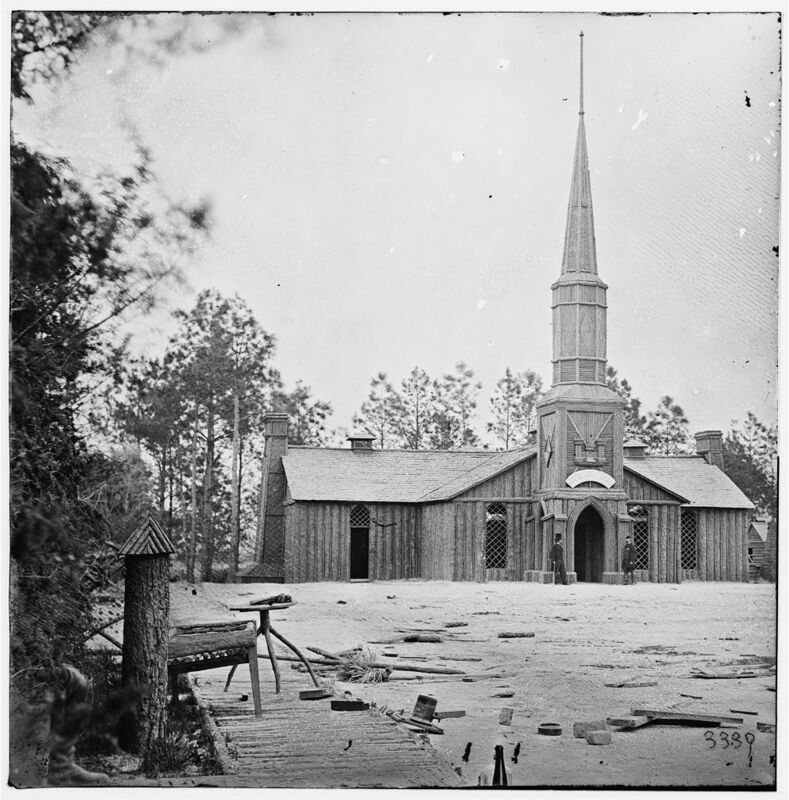 Church built by 50th New York Engineers at Poplar Grove." Photographer unattributed but likely O'Sullivan. Debris scatter is identical to the previous image. Cloth removed from the interior of the church windows; grill removed from the leftmost window. LC 02850 detail. Prominent civilian and a brigadier general posed at the church entrance. LC 02850 detail. Placard above the door reads: "Presented to the Trustees of Poplar Grove Church By the 50th N.Y.V. ENG." NARA - 524441. 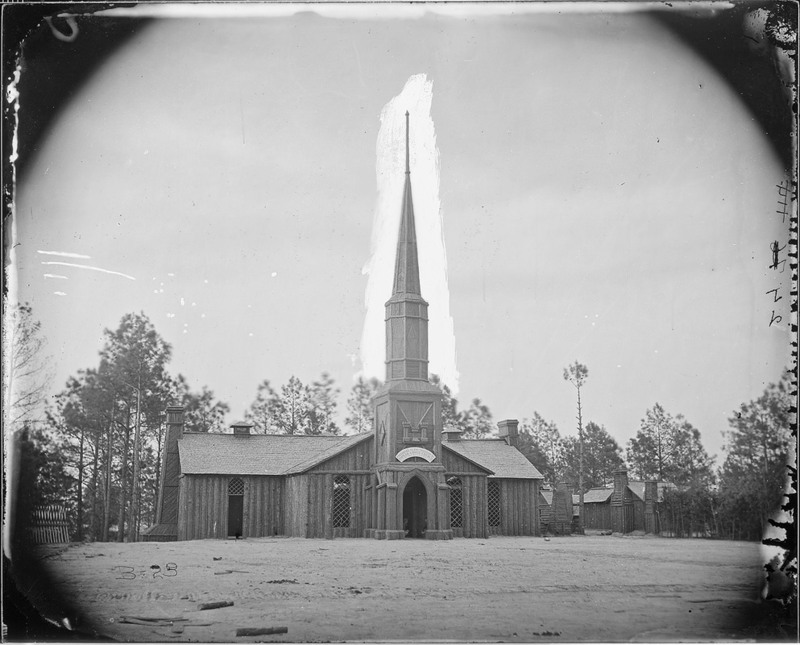 "Poplar Grove Church near Petersburg." Variant of the above photograph with two men crouching in the doorway. LC 03343. "Hdq. Petersburg, Va. 1864-5," image by O'Sullivan (unattributed). These are the same huts to the left of the church that appear in earlier photos. LC 03343 detail. Timothy O'Sullivan's assistant "Vest Man" poses in the wheelbarrow in front of the leftmost building. Making Gabions and Fascines- 50th NY Engineers. Drawing by A.W. Waud, LC 3a16920.